This car has remained in the same family since it was purchased. It has never been restored, only maintained, and is presented in its original paintwork. It has, however, always benefited from being garaged. It was purchased new from the above dealer in 1967, Mr E. Williamson deciding that the Triumph Herald Estate should be traded, as it was a little small for the growing family. The cost when new was £910. 6s. 8p; a slight discount was given due to the family connection with the dealer. Originally Mr E. Williamson wanted the blue and white duo-tone colour scheme which was offered on this model, but was persuaded by his uncle that Rose Taupe and Sandy Beige was more distinguished. Having made the colour choice and placed the order, there was a wait of 9 months before the car was delivered. The car was collected from the dealer on a Wednesday lunch time and its first journey was to collect the children from school. Only one modification was added to the car that being a set of rear seat belts for the children. These are similar to the motor racing harnesses of today, and in order for them to be fitted to the vehicle, the fuel tank had to be removed. The seat belts are still attached to the vehicle but have been stowed under the rear seat as they are not of an adult size. The radio option was not selected as Mrs Williamson was of the opinion that it would be a distraction to driving! The first long trip in the car was a family holiday to Scotland; this was a perfect opportunity to “run the car in” as was the custom with engines of the time. When the family migrated to Australia it was decided to sell the Morris and it was returned to Williamson Motors on consignment. 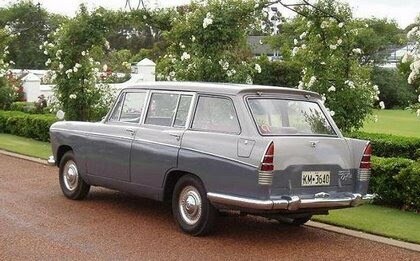 After a week in the showroom it was decided that the Morris would accompany the family to Australia and as such it was duly dispatched to Tilbury docks where it was loaded aboard a ship for Fremantle arriving in January 1969. The Morris has always given faithful service and served the family well on their many holidays in W.A, it was even driven in a Royal Procession (by mistake!). Never the most modern of styles and certainly not the fastest car on the road it was always reliable. By 1977 it was the car in which the children learnt to drive and subsequently it was used to take them to university and the odd party. By the time the children purchased their own cars the Morris had found a new lease of life catering for the demands of the more elderly members of the family. They found the wide opening doors and slightly higher driving position far more comfortable than the more modern modes of transport available at the time. Mr E. Williamson always had a soft spot for the Old Morris as it was known in the family, and many overseas holidays ended with car parts being placed in the hand luggage, shock absorbers from Singapore, windscreen and door rubbers from the UK. In fact the day Mr E. Williamson passed away the Old Morris was due to have the headlining and carpets replaced. Following Mr E. Williamson’s death the car was taken over by his son, it is used on club events and recently it had a cameo roll in the ABC TV mini serries “Shark Net”.